Collecting antique toy boats can be a fun and nostalgic journey back to one's childhood. Many collectors look for the kind of the boats they had as a kid, or the kind of boat they always wanted. Are you interested in collecting antique toy boats or antique toy ships? Is there a difference? One easy way to distinguish the difference between a ship and a boat is to remember that a boat can fit onto a ship, however. a ship cannot fit onto a boat. Ships are usually classified as large ocean going vessels. Boats are typically much smaller than ships. In the past, a sailing vessel with three rigged masts or more was considered a ship and anything with less than three rigged masts was considered a boat. Obviously, a submarine is neither a boat nor a ship. 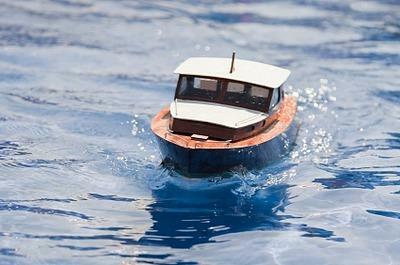 If you've never heard of pop pop boats, they are a very popular collectible vintage toy boat. These boats are powered by steam that is created when water is heated inside a thin coiled tube of copper. The end of the tube sticks out behind the boat. When the water boils, the steam jets out the back, propelling the boat forward. Collecting antique toys can be a very emotional and nostalgic experience. Many toy collections start from family members saving their favorite childhood toys in hopes of passing them on to the next generation. There can often be emotional attachments to the toys themselves. Many carry the energy of fond childhood memories. However, this does not mean that collecting toys, especially toy boats, is only a hobby for amateurs. Antique toy collections can be worth millions of dollars. A good example is the recent Sotheby's auction in New York of the Malcom Forbes' collected extraordinary antique toys over four decades. A major portion of the auction was Forbes' amazing collection of sports, naval, commercial and luxury antique toy boats, considered one of the finest collections of this type in the entire world. The Forbes' toy boat collection included pristine examples from "The Golden Age of Toys", a period of time from the 1870's to the 1950's. The collection also included boats and ships from every major toy boat maker such as Marklin, Bing, Fleischmann and Carette. The largest ship in the collection was called "Andre the Giant", a 72 inch long cast iron replica of a 19th century, gas-engine powered battleship, estimated to be worth $200,000-$300,000. The Forbes entire antique toy collection sold for 2.3 million dollars on December 17, 2010. The Internet has become the single most valuable resource for antique collectors. No matter what kind of collection you have, there are usually great resources online. Buzz's Boatyard claims to be one of the largest toy boat and ship sites on the Internet. It it's a good place to connect with other collectors. The site has a page dedicated to collector networking, which includes e-mail addresses for all the collectors registered with the site. You can also browse through the antique boats for sale. Other types of antique ship models and toy boats you can find on Scherbak's site include battleships, submarines and an old Indian rowing canoe. Gasoline Alley Antiques has different categories you can browse through related to antique boats such as pre and post World War II toy boats, live steam and putt-putt boats, sailboats, model kits, submarines, diecast, plastic and other miscellaneous nautical memorabilia. Should you need help restoring an antique toy ship or boat that you've come across, Old Foundry Toy Works can help rebuild and restore many antique toys, including toy boats and toy ships.